One of the many dangers to wildlife is traffic on our roads. This weeks species the Badger (Broc) I unfortunately saw as road kill along the R409 last week. The badger is one of Ireland’s noctural mammals that emerge from their underground setts at night-time to feed. Badgers are omnivores meaning they will feed on both plants and animals. They will eat insects in particular earthworms but they will also feed on small mammals, amphibians, birds and berries. 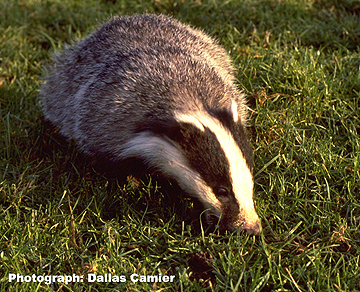 A male badger is known as a boar, a female badger as a sow and young badgers are known as cubs. They are easily recognized with their grey fur and white head that has two black strips running from below each nostril to the back of the head. They can grow to one metre in length and have short legs with powerful claws for digging their underground setts. Badgers can be found in all counties of Ireland and are very sociable mammals living in groups of up to six adults. The badger will build their setts in dry land often in woodlands, roadside verges or banks. Each sett will have a number of entrances that will lead to a large chamber for sleeping and a number of smaller chambers for rearing their young. A badger will have 2-3 cubs in early Spring, the young cubs remain underground for 8-10 weeks before emerging from the sett when their mother will begin to teach them how to hunt and protect themselves in early summer. Although badgers are a protected species in Ireland under the Wildlife Act of 1979 there have been licensed culls in the Republic of Ireland as they have been considered a species that has possibly contributed to the spread of Bovine TB in cattle. In Britain during World War II badger meat was eaten although not consumed today their hair is used to make shaving brushes and paint brushes due to its water retention abilities. This entry was posted in Wildlife Watch at the Bog of Allen Nature Centre and tagged Activities, Attraction, Bog of Allen Nature Centre, Conservation, IPCC, Kids, Nature Trail, Places to Go, Things to Do, Visitors, Wildlife. Bookmark the permalink.